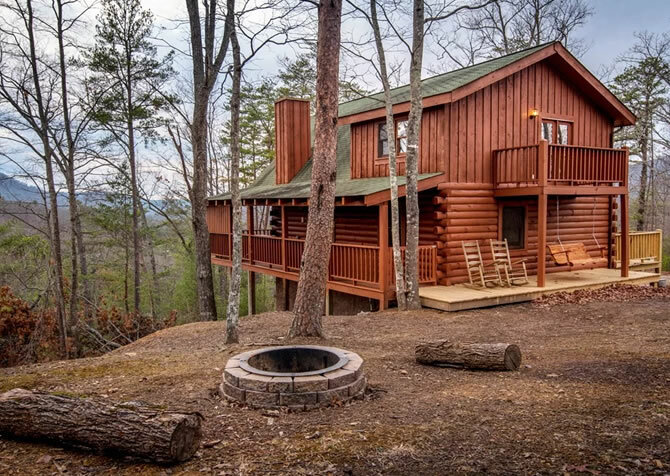 Relaxation and fun come together where mountain meets modern fun in this charming and color-filled 1-bedroom pet-friendly cabin under 1 mile from historic downtown Sevierville, long-time home to the famous Dolly Parton! Surprise a loved one with a romantic escape for 2 or bring a small family getaway (including the pups!) 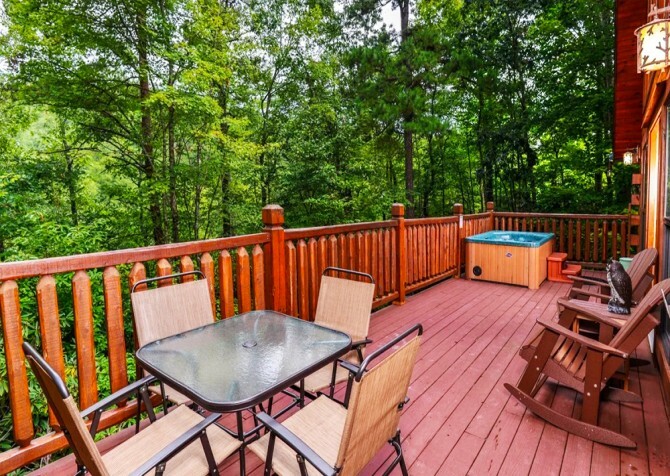 to the Smokies with enough accommodations for up to 6 guests. 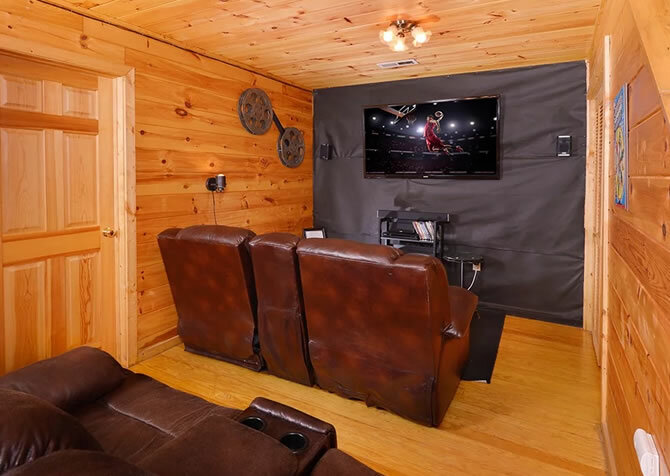 Enjoy spending time together in the open-concept cabin with ample natural lighting from the large windows while playing foosball, darts, and pool in the rec area or playing board games around the dining table. Enjoy home-cooked meals from the fully loaded kitchen to save money for extra excursions or souvenirs while exploring The Old Mill District in Pigeon Forge. This cozy single-level cabin is located in Hidden Springs Resort, lending guests a smooth, easy drive to the cabin and community pool access! The relaxing amenities of A Wild Hare complement any exciting vacation to the Great Smoky Mountains! After a thrilling ride on the class III and IV rapids of the Pigeon River, dry off and host a picnic lunch on the back deck around the outdoor cushioned set with savory hamburgers hot off the grill. Take a tour along the Rocky Top Wine Trail for an anniversary and bring home a bottle of wine to enjoy while relaxing in the bubbly waters of the outdoor hot tub on the deck as the sun sets through the trees. At night, slip under the covers of the California king-size bed after a long soak in the large indoor jetted tub, soothing tired feet after a day of hiking in the Great Smoky Mountains National Park. End each night with cuddling by the fire in the stone fireplace while a movie from the cabin’s DVD library plays on the large flatscreen above the mantel. With the best of both relaxation and fun, A Wild Hare is your next romantic destination or laid-back family getaway cabin! Super fun, cozy, and unique, the open-concept living room is illuminated with ample natural lighting by large windows overlooking lush mountain forestry. Cuddle on one of the large leather couches while unwinding at the end of each evening with hot tea and romantic fires in the stone fireplace. Not quite tired after exploring? Play board games around the large leather ottoman or choose a DVD from the cabin’s library to watch on the big screen TV above the mantel before crawling into bed for a restful night of sleep. Kick your feet up on one of the red velvet foot stools and finally finish that book you have not had the time for at home, or squeeze in an afternoon nap on the leather sofa before getting ready for a romantic dinner downtown. Colorful pillows and a funky rug add to the whimsy of this interesting and inviting room! Save money and impress your special someone with a home-cooked meal using all the tools and appliances you could need in the convenient fully loaded kitchen. Cut and prepare all your ingredients on the spacious kitchen island for each meal or settle into the high-top stools to nibble on appetizers and sip on glasses of your favorite local wine. The full-size refrigerator and microwave make storing and reheating leftovers or quick frozen meals easy. Enjoy the convenience of freshly brewed coffee in the comfort of the cabin and delight in each morning of your stay while sipping and taking in the views from your deck’s rocking chairs. Under the light of the funky chandelier, take a seat around the lovely 4-chair dining set for quiet, romantic meals with your special someone or trade stories of your favorite moments from your family trip to Dollywood. Set the table with the cabin’s charming supply of plates, utensils, and glassware without much fuss for cleanup thanks to the kitchen’s dishwasher. And once the table is cleared from your delicious homemade meals, set up your favorite board games from home for family game nights in the cabin. Couples will love the plush California king-size bed of this impressive master suite; when it comes to relaxation in the Smoky Mountains, not much tops the tranquil forest views from the large indoor jetted tub in privacy of your bedroom. Unwind at the end of day with a good book and a warm fire in your bedroom’s fireplace or watch a movie on the bedroom’s flatscreen TV before drifting off to sleep for the night. The satin covers, serene scenery through your window, and ample space to unpack your suitcases add to the comfort of your cozy cabin bedroom. Extra guests can enjoy restful nights of sleep by a dreamy fire and movies on the large living room flatscreen TV while drifting into slumber on the 2 sleeper sofas, perfect for small families or vacationing couples. 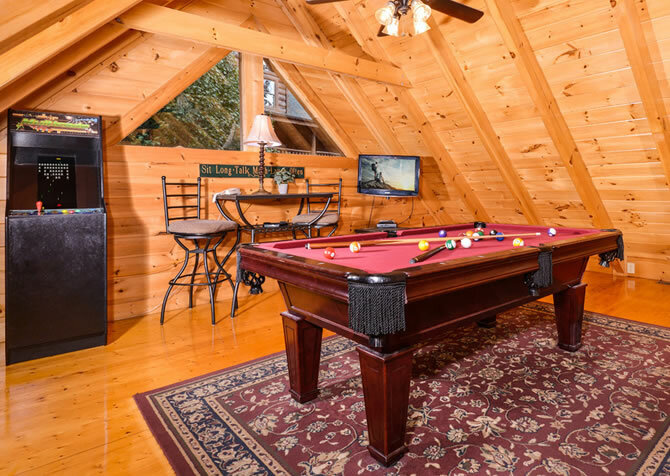 Grab a few beers from the refrigerator and hang out in your cabin’s private pool hall in the rec room adjacent to the living room for fun evenings of laughing and playing some competitive games of pool. Wait your turn on the pool table while seated at the high-top table by the window and enjoying your drink and tunes playing on the CD Player. Try your hand at darts during cabin downtime or challenge the kids to a game of foosball before sitting down to dinner each night. Settle into your rocking chair and soak in the lovely Smoky Mountain forest views while listening to your favorite podcast or enjoying your morning coffee each day before shopping and exploring at The Island in Pigeon Forge. Take advantage of Hidden Spring Resort’s impressive indoor swimming pool when you want to keep up with your exercise routine with a couple laps or lounge around in between cooling dips. Crisp mountain evenings are complemented well with warm, soothing steam while soaking in the outdoor hot tub on your cabin’s back deck before wrapping up in a towel and enjoying dessert wines and card games around the table of the outdoor cushioned seating. Experience the Smoky Mountains like never before – hundreds of feet in the air! Scenic Helicopter Tours offer a variety of tours to fit every budget, along with special parts of the Great Smoky Mountains National Park only visible while gazing from the skies above! Hailed as one of the most beautiful areas of the Great Smoky Mountains, Cades Cove is a gorgeous valley tucked into the mountains where a sleepy, historic cabin village once resided. Parts well-preserved can be viewed while touring the 11-mile Loop Road by car, bike, or horseback! Explore the pristine beauty of the mountains with a revitalizing hike with a furry friend that carries your pack for you! At Smoky Mountain Llama Trek, their friendly pack-animal family is ready to show you through the Smokies with your own llama in-tow for a fun experience you will always remember! "This cabin is amazing, and the pictures really don't do it justice. It is gorgeous inside, and just enough room to not feel cramped. A few things to note: the shower is in the bathroom connected to the bedroom. With the fireplace you can see…"
"This cabin is amazing, and the pictures really don't do it justice. It is gorgeous inside, and just enough room to not feel cramped. A few things to note: the shower is in the bathroom connected to the bedroom. 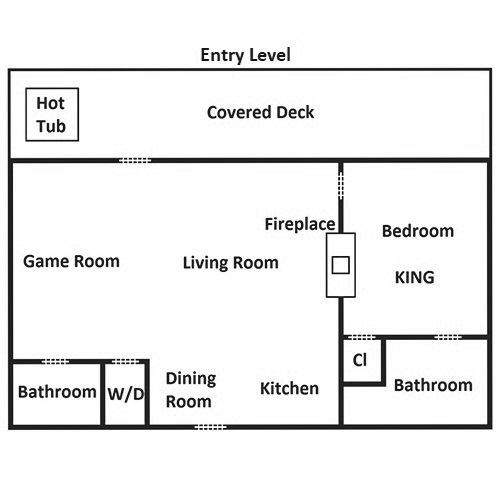 With the fireplace you can see through from the living area to the bedroom, but is easy to cover. The couches are pull out, and there is an air mattress. The indoor heated pool is a short drive away, it was a nice additional activity for the kids. The kitchen is well stocked with cooking utensils and there is grill out front. I was a little worried about selecting this cabin as there were no previous reviews, but it is well worth it. Amazing cabin for the price, good location, and it offers plenty for the kids to do with out needing Wifi. Great stay for a family on a budget!" Thank you so much for the awesome review! We are so glad to hear you enjoyed your stay at A Wild Hare from the indoor heated community pool to the kitchen and grill and are looking forward to serving you again in the future!